In the most recent issue of the “Globe” magazine of ETH Zürich, our projects SBB Green Class and GoEco! were featured as a way to understand human mobility, improve environmental performance and enable intelligent demand management. Multi-modal mobility, trip analysis, eco-feedback generation and smart mobility management are seen as important building blocks for the future of travel, all conveniently supported by a smartphone app that can record mobility and communicate with the user. 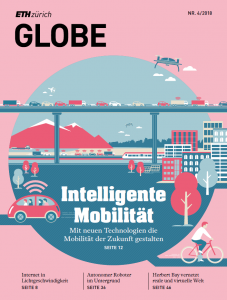 You can download the “Intelligent Mobility” issue on the ETH Zürich website.